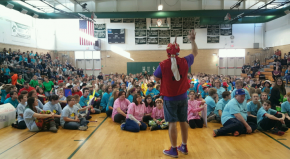 For months, student teams from around New Hampshire joined teams from 30 countries in selecting one of seven Destination Imagination Challenges based in different core areas including Technical, Scientific, Structural, Fine Arts, Improvisational, and Service Learning. In solving these challenges by themselves, they build collaboration, creativity, confidence and problem solving skills that will last a lifetime. 57 teams put their Challenge solutions to the test at Monadnock Regional High School in Swanzey today, and the top scoring teams in each age group and Challenge will advance to N.H. Destination Imagination State Finals on April 1 in Bedford. Top scoring teams from that meet will qualify to represent New Hampshire with top scoring teams from each state, Canadian province and some 20 countries at Destination Imagination Global Finals in May. Tomorrow at Goffstown High School, 91 teams will compete to advance to the state finals meet, completing the first round of tournaments for over 2,000 students in New Hampshire.